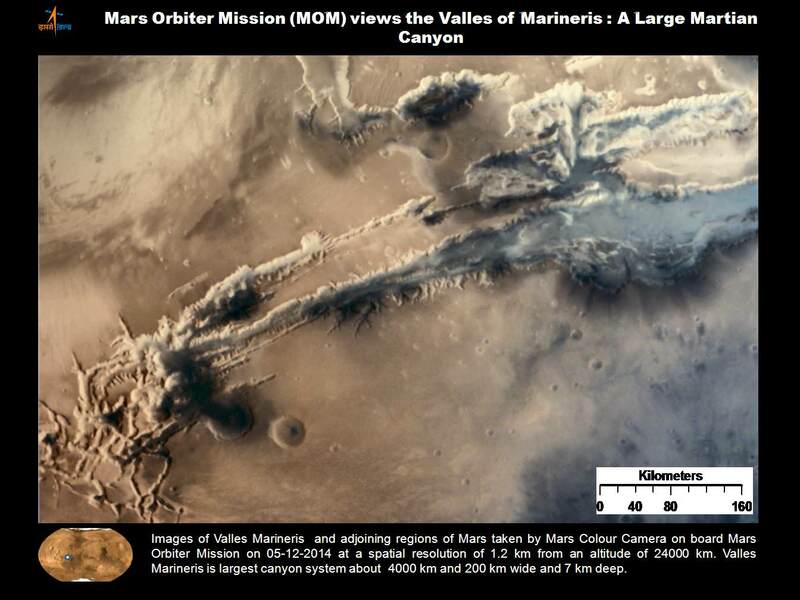 India’s maiden interplanetary voyager, the Mars Orbiter Mission (MOM) has transmitted a breathtaking new image eyeing the limb of Mars and its atmosphere against the blackness of space. The beautiful Martian image is only MOM’s second since successfully braking into orbit during the ‘history creating’ insertion maneuver days ago on Sept. 23/24. The MOM orbiter was designed and developed by the Indian Space Research Organization (ISRO), India’s space agency, which released the image on Sept 25, about a day after MOM arrived. “A shot of Martian atmosphere. I’m getting better at it. No pressure,” tweeted ISRO at MOM’s newly established twitter account after entering orbit. 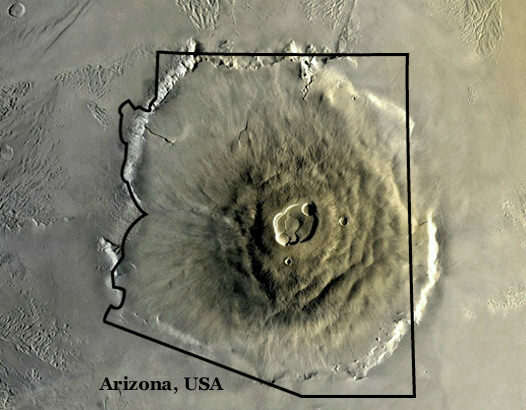 The image has a spatial resolution of 439 meters and is centered around Lat: 20.01N and Lon:31.54E. MOM’s goal is to study Mars atmosphere , surface environments, morphology, and mineralogy with a 15 kg (33 lb) suite of five indigenously built science instruments. It will also sniff for methane, a potential marker for biological activity. “The view is nice up here,” ISRO tweeted. 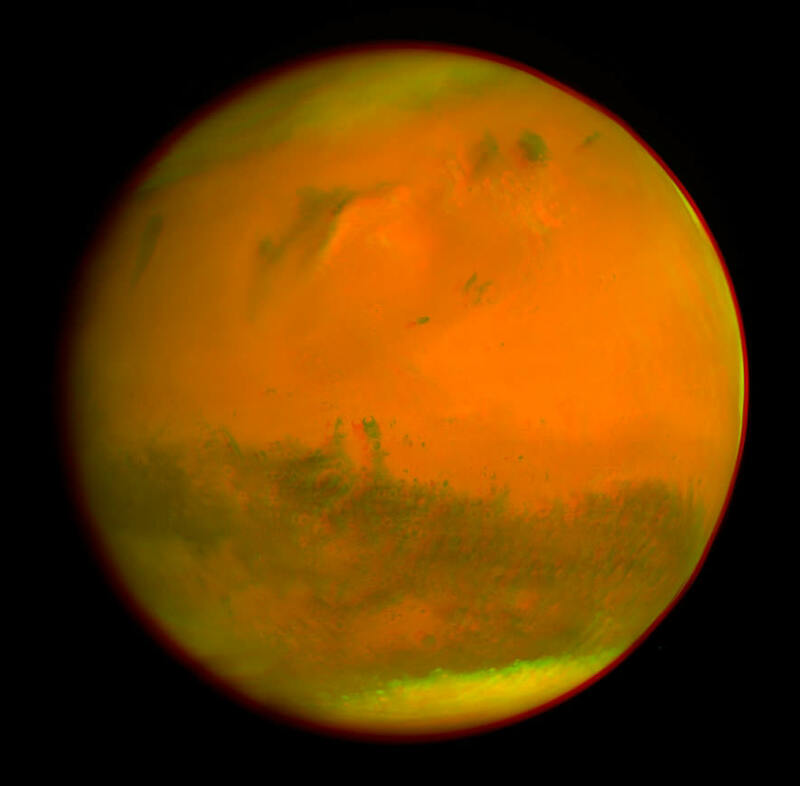 MOM’s first image taken shortly after orbital arrival showed a heavily cratered region of the Red Planet taken by the MCC tri-color camera from a slightly lower altitude of 7300 kilometers with a spatial resolution of 376 meters. Following MOM’s successful Mars Orbital Insertion (MOI) maneuver, India became the newest member of an elite club of only four entities who have launched probes that successfully investigated Mars – following the Soviet Union, the United States and the European Space Agency (ESA). 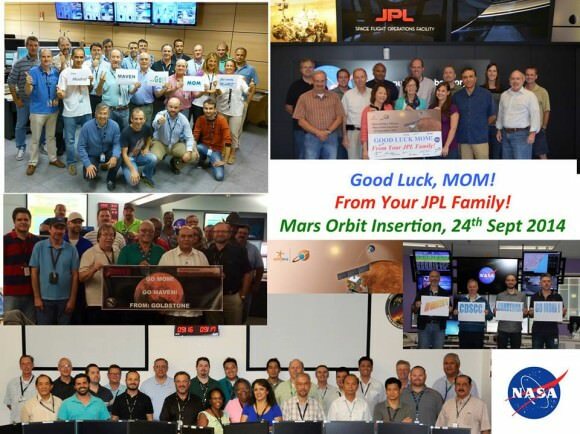 Read my complete MOM meets Mars arrival story – here. MOM is now circling Mars in a highly elliptical orbit whose nearest point to Mars (periapsis) is at 421.7 km and farthest point (apoapsis) at 76,993.6 km. The inclination of orbit with respect to the equatorial plane of Mars is 150 degree, as intended, ISRO reports. 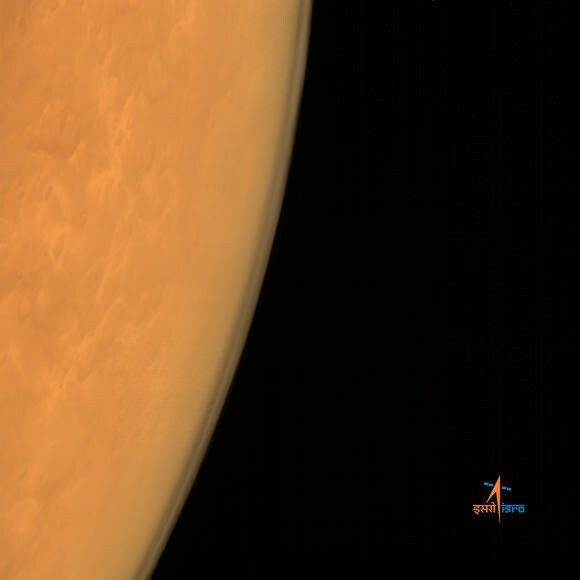 India’s “history creating” maiden interplanetary voyager, the Mars Orbiter Mission (MOM) has captured her historic first image of the Red Planet. The Indian Space Research Organization (ISRO), India’s space agency which designed and developed the orbiter released the image today, Sept 25, just a day after MOM successfully arrived at Mars on Sept. 23/24. 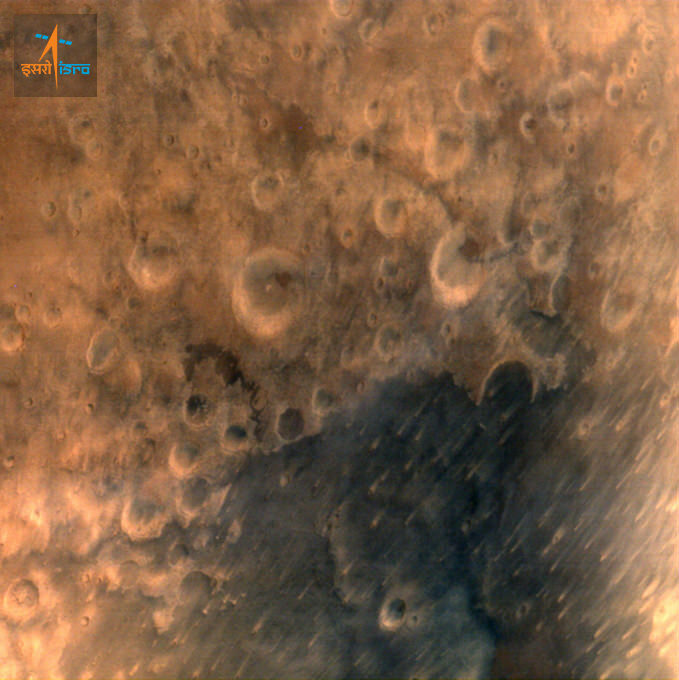 The image was taken by the probe’s Mars Colour Camera (MCC), tri color imager, from a height of 7300 kilometers with a spatial resolution of 376 meters and shows a heavily cratered region on the Red Planet. 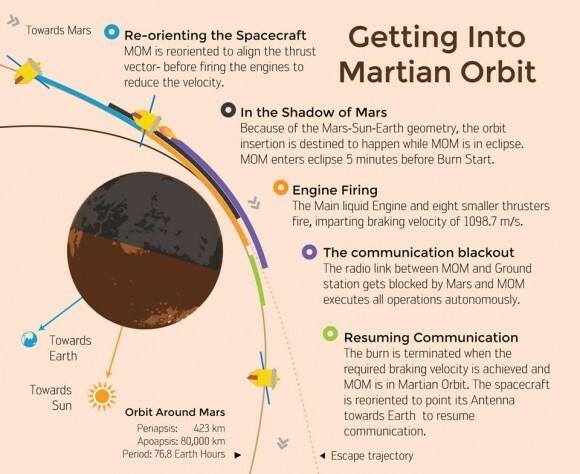 Following MOM’s successful orbital insertion maneuver, India joined an elite club of only three other entities who have launched probes that successfully investigated Mars – following the Soviet Union, the United States, and the European Space Agency (ESA). MOM is now circling Mars in a highly elliptical orbit whose nearest point to Mars (periapsis) is at 421.7 km and farthest point (apoapsis) at 76,993.6 km. 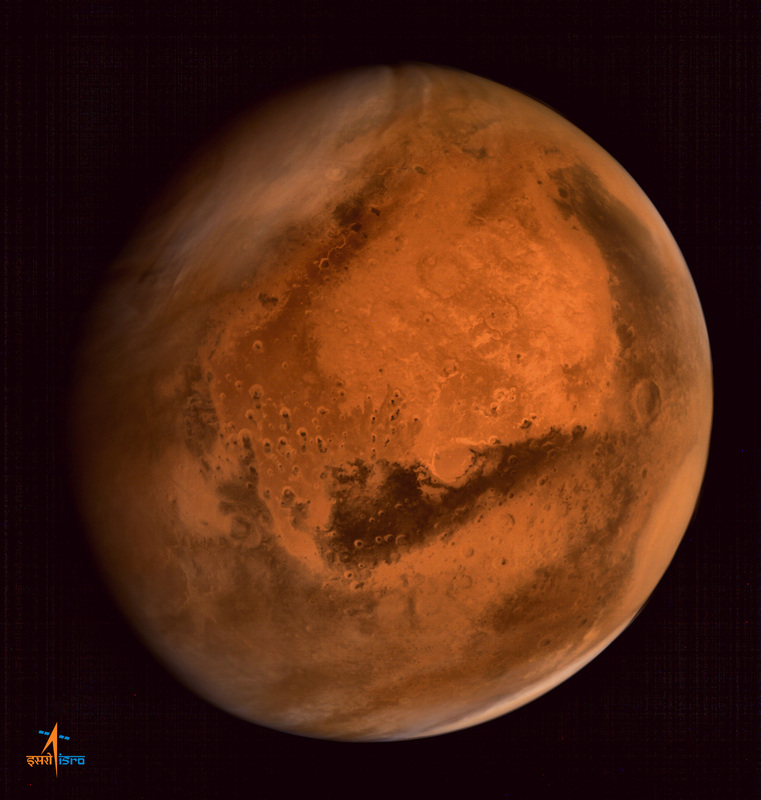 The inclination of orbit with respect to the equatorial plane of Mars is 150 degrees, as intended, ISRO reports. By way of comparison, here’s the first image taken by MOM of the Blue Planet, her Home World.